If you are one of those lucky metropolitan area CATV systems with direct fiber connections to the major TV studios, no need to worry about over-the-air HDTV reception difficulties. There are also many instances when temporarily installed, inexpensive rooftop TV antennas produce perfect HDTV pictures at the CATV head-end. However, those situations are the exception not the norm. In the majority of the cases, especially in Grade “B” contour areas or beyond, low performance TV antennas cannot guarantee the absence of spectrum sock-outs, nor satisfactory protection against adjacent or co-channel interference. And last but not least, under inclement weather conditions HDTV pictures can brake up, freeze or just fade away. Subscribers, who were no terribly upset when their analog pictures showed an increase in background noise or faint artifacts (interference) in the pictures, can become really agitated when those crystal clear, high definition pictures suddenly collapse or suffer from distortions. The over-the-air HDTV reception signal processing starts at the receiving antenna. To make the proper antenna selection, to come up with an efficient phased-array design for interference elimination it is essential to have the latest and pertinent reception information. Without the proper information HDTV reception is doomed to failure. On the other hand Cable TV engineers, armed with a computer aided TV reception study, and the will to use the results and recommendations, should be in a much better position to receive, process and deliver all desired over-the-air DTV programs with superb picture quality and exceptional reliability. Your subscribers’ reaction: the sooner, the better. A computer-aided over-the-air High Definition TV reception study contains the computer run and the signal direction sheets. A Computer Run lists in increasing distance order all analog and DTV stations within 50 to 75 or 100 mile radius. The listing includes major technical and program parameters, as well as computer processed great circle distances and Azimuth Angle calculations. 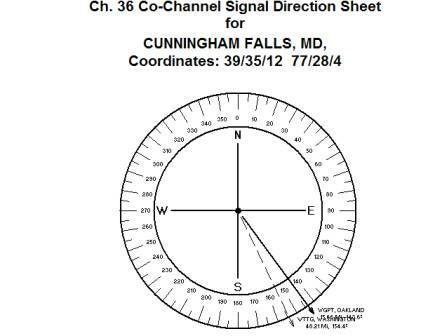 Signal Direction Sheets present the computer calculated distances and directions in visual format, giving a fast overview of complex reception conditions. Reception conditions in the Downtown Chicago area head-end are typical for a major metropolitan area, with the two major TV antenna farms, on the Sears Towers and the Hancock Building, clearly visible from the antenna-site. The computer developed listing below shows all potential analog and DTV stations in a 77 mile radius. The computer calculated great circle distances are accurate within 0.01 mile, the Azimuth Angle directions within 0.1 degree. The X in the DTV column designates HDTV broadcasts. An asterisk after the location indicates that the DTV transmitter is not in operation yet. The computer run shows that all DTV stations, except Channel 3 WBBH, the Chicago CBS station, operate in the UHF band. From the nine (9) analog Chicago stations six (6) broadcast their HDTV programs on adjacent channels. This represents a tremendous advantage for those stations, which have problems securing space on the transmit tower for new DTV antennas. Thus eliminating the old antenna and replacing it with a new one to handle both analog and digital signals, it will not require new tower space nor will increase tower loading. However, as it will be discussed later, the new adjacent channel operation may create significant difficulties at the receiving end, at the CATV antenna site. Observe the variation in the radiated output power. Not all UHF DTV transmitters operate with 1000 or even 200 kW output power, thus creating great variations in received signal levels. A fact which may escape many engineers, developing antenna bill of materials. The case of Channel 3, WBBH-DTV, requires special attention. With 3 kW effective radiated output power the projected Grade “A” or Grade “B” contour area of the station is just a small portion of the standard coverage. Nor could potential adjacent channel or co-channel interference conditions to be neglected. 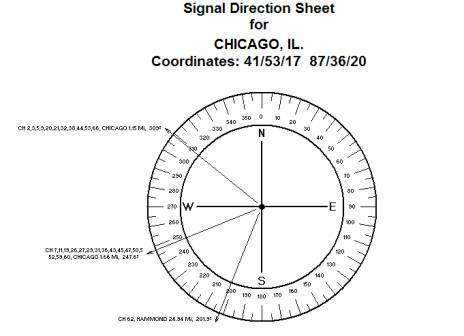 The signal direction sheet, prepared for the Downtown Chicago CATV head-end, and presented below, shows all analog and DTV UHF stations within a 50 mile radius. Four UHF analog stations, located on the Sears Tower operate their DTV affiliates on UHF. Thus a single, high-gain high-directivity antenna, such as an 8’ parabolic, should deliver high quality and reliability pictures on all eight (8) channels. The computer calculated distances to those eight (8) transmitters are 0.65 mile or 3322 feet. Considering the height of the average transmit antenna on the Search Tower, in the 1550 ft range, the elevation angle at the CATV antenna site will be much more than the usual 1 or 2 degrees. The parabolic should be carefully raised to the proper elevation angle to avoid unnecessary reception difficulties. The application of the high directivity 8’ parabolic is further justified due to dangerous ghosting (reflection) conditions in the Downtown area. The multitude of skyscrapers, the highly reflective surfaces on those building are natural sources of reflections. The application of a high directivity 8’ parabolic is no guarantee to eliminate all possible reflections, but under the given difficult circumstances that’s the best we can do. 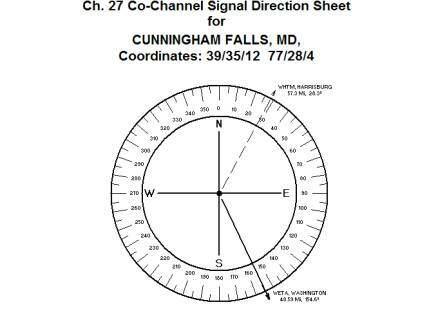 For a discussion of over-the-air reception of HDTV signals in the more distant Grade “B” contour area, the computer aided Cunningham Falls, Md. HDTV reception study was selected. This rural location produced all typical reception difficulties of a system receiving HDTV signals from two major metropolitan areas plus a few local stations. In the DTV column X denotes the HDTV stations. The asterisk after the name of the city mark those facilities which are licensed but not in operation yet. All HDTV stations, except Channel 12, WWPX, Martinsburg are UHF stations. From a total of 22 HDTV stations in a 50 mile radius six (6) facilities were not on-the-air at the time of the study. The listing clearly shows the tremendous variation in output power, such as 14 kW for Channel 29, WMPB, Baltimore versus 955 kW for Channel 46, WBFF, Baltimore. There are again a number (five) station where the new UHF HDTV facilities operate adjacent to the original analog TV transmitters, causing reception difficulties at the CATV head-end. More about this to be discussed and analyzed later. 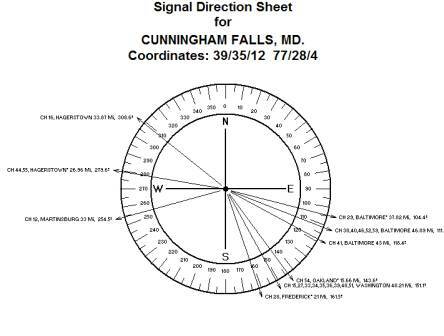 The signal direction sheet below, developed for the Cunningham Falls, Md. CATV antenna site, presents all analog and DTV UHF stations in an easy to digest visual format. Observe that not all Baltimore area stations are received from the same direction. On the other hand, a single, large diameter parabolic dish, enhanced with an antenna-mounted wide-band UHF preamplifier could deliver the pictures of five HDTV channels plus one analog station. Three separate parabolic antennas should facilitate the reception of all 13 Washington, D.C. and 3 Oakland UHF channels. The simultaneous operation of the analog TV stations and their DTV affiliates, a condition expected well into year 2008 or even beyond, created extremely crowded reception conditions in the 470 to 800 MHz frequency range. Adjacent channel interference became the norm, not the exception. A typical Grade “B” contour adjacent channel interference case is presented on the signal direction sheet below, demonstrating potential interference conditions for the reception of Channel 29, WMPB-DT, Baltimore. Technically, Channel 29, Baltimore is squeezed-in between Channel 28, Frederick, at a distance of 21 miles and 57º relative angle, as well as Channel 30, Red Lion, at 52 miles and 40º relative angle. On-site tests and measurements are mandatory to verify the relative level of interference, to select the correct antenna or to design a phased-array for interference protection purposes. 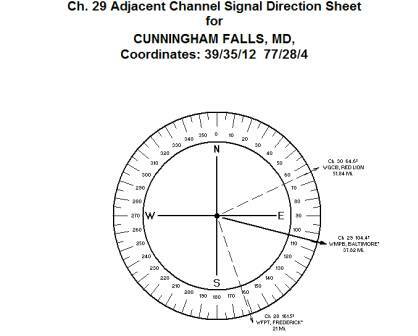 Co-channel interference, an every day event of VHF, may also occur on UHF channels, as indicated by the special signal direction sheet below, developed for the reception of Channel 27, WETA-DT, Washington, D.C. Note the distances involved: The desired Channel 27, Washington, D.C. is received from a distance of 48 miles, while the undesired Channel 27, Harrisburg arrives from 57 miles, almost the same distance. The signal direction sheet provides the proper basic information. However, the level of co-channel interference must be verified again by properly conducted on-site tests and measurements. Occasionally a special signal direction sheet, like this one below, prepared for the reception of Channel 36, WTTG-DT, may discover a channel assignment anomaly. The desired DTV station, Channel 36, Washington, D.C, received from a distance of 48 miles, will be exposed to extremely strong co-channel interference by Channel 36, Oakland, only 16 miles away. Also note the small relative angle, less than 11 degrees. Neither a parabolic, nor a single log-periodic antenna or Yagi would be capable to provide reasonable co-channel protection. The application of a phased-array is mandatory and even that approach may not result in 100% protection. Another possibility: since Channel 36 Oakland, an analog educational station is grandfathered, WTTG, Washington, D.C. if they really care about the quality of their pictures, received in the field, should apply for channel re-assignment.